Bellah’s treatment of the four great civilizations of the Axial Age — in ancient Israel, Greece, China, and India — shows all existing religions, both prophetic and mystic, to be rooted in the evolutionary story he tells. 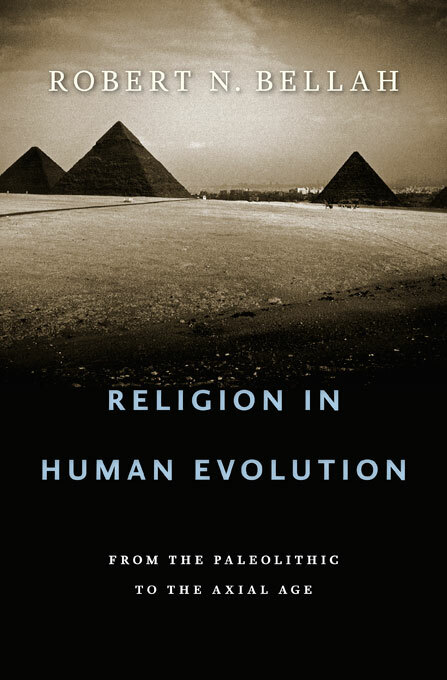 Religion in Human Evolution answers the call for a critical history of religion grounded in the full range of human constraints and possibilities. This is an extraordinarily rich book based on wide-ranging scholarship. It contains not just a host of individual studies, but is informed with a coherent and powerful theoretical structure. There is nothing like it in existence. Of course, it will be challenged. But it will bring the debate a great step forward, even for its detractors. And it will enable other scholars to build on its insights in further studies of religion past and present. This great book is the intellectual harvest of the rich academic life of a leading social theorist who has assimilated a vast range of biological, anthropological, and historical literature in the pursuit of a breathtaking project. Robert Bellah first searches for the roots of ritual and myth in the natural evolution of our species and then follows with the social evolution of religion up to the Axial Age. In the second part of his book, he succeeds in a unique comparison of the origins of the handful of surviving world-religions, including Greek philosophy. In this field I do not know of an equally ambitious and comprehensive study. See an interview with Robert N. Bellah on his new book: "Where Does Religion Come From?" (The Atlantic, August 17, 2011). Post by Robert Bellah at "The Immanent Frame" on his new book: Where Did Religion Come From? An interview with Robert Bellah on his book here (60 minutes). Habermas on Europe and the "New German Question"